In this lesson I’d like to teach you how to make a good looking lyric video for youtube. We will use the latest single of Dj. Snake feat Justin Bieber – “Let Me Love You”. After reading this tutorial you’ll be able to create professional looking simple lyric videos for your songs, for popular tracks, for releases of your band, for everyone! 4. File > Import File (Ctrl + I). Import your audio and drag it to a timeline. duplicating a previous text layer. Then sync a bit more words now. Looks like we’ve got some stuff here and we may start working on animation. 8. But before, we have to make right positions for these layers. 9. Very important thing in lyric video production – to make a moving camera. For this: Layer > New Null Object (Ctrl + Shift + Alt + Y) and Layer > New Camera (Ctrl + Shift + Alt + C). Choose all layers and make it 3D. 11. Let’s get back to words. *While you’ll be moving this, move only with 3 dimensions. All layers should be in one plane. And here, is the most creative part in production. You may do with your lyrics – all what you want! Place it how you want, rotate, change scale and etc..
something you just need to make a keyframe. 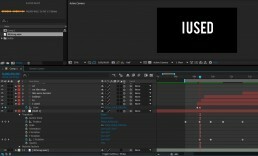 Any animation = difference between keyframes. Also, as you see, I’ve added 2 keyframes to Scale of the layer “I Used”. I’ve changed “Anchor Point” settings. It’s very important. Added 2 keyframes to “X Rotation” parameter. Looks not bad, but let’s improve this. 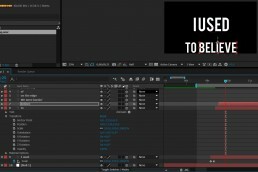 Copy-paste these keyframes to the word “Believe”. Now, this phrase is looking nice. May be it should be a bit longer on the screen, but we have go to the next phrase 🙂 Also, don’t forget to cut those layers which have left the screen. To avoid their appearance on the next scenes. 14. For “We were burnin'” I’ve used Scale and X Rotation parameters with expression. Just copy it from previous layers. 15. “On the edge” is animated with “Opacity”. 16. “Of something beautiful” is animated with “Anchor Point” and “Opacity”. Wow, looks like we’ve animated 5 seconds of lyrics. Congratulations! This black screen makes me feeling a bit bored. Let’s add an artwork of this single to the background. with colors a bit, choose what do you like and what is looking nice. Also, I’d suggest to add Layer > Drop Shadow. It will add some contrast. “Effects & Presets” and drag it on your background image. I’ve used “Gaussian Blur” with “Bluriness” on 33.
lesson. I want to add some life to the background, let’s make it moving a bit. And after draging it to our background, our image is moving like crazy..
Not what I’ve been looking for. 19. We have to change “Speed” “Amount” and “Rotation” parameters now. 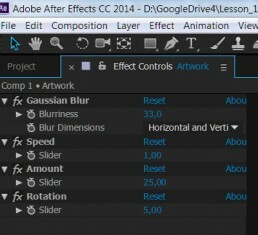 Let’s make it 1, 25 and 5.
layers and turn on “Motion Blur” box. Looks better, isn’t it? your first time in After Effects. But I’ll write a big FAQ about it in my next lesson. Well, we’ve done a good job now. This lyric video scene is looking simple but pretty nice now. Now you have enough knowledge to make your first full lyric video. If you want to get more lessons like this, and to learn more about lyric video industry – please subscribe! Please subscribe for more lessons and free projects soon! Thank you! Why Nobody Listens To Your Music or Watches Your Lyric Videos?